Annan Athletic F.C. are delighted to announce that the club have once again teamed up with the Scottish Football Partnership to deliver another community programme to the residents of Annan and the local area. The club will invest the funding from their SFP’s Community Initiative award to increase our provision of community engagement under the banner “Inspiring Active Lives” to young children aged between 2 and 4 currently enrolled in childcare facilities in the local area. 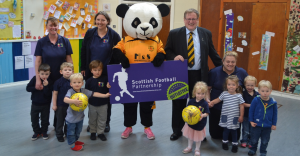 The club’s mascot “Galapanda” will be the figurehead for this exciting new initiative which will see free introductory sessions delivered to the 12 council-run nursery schools in and around Annan. Each of the 35 children in these nurseries will receive a block of four one hour weekly sessions and from this the club hope to target free physical activity to a maximum of 420 pre-school children. Chairman Henry is pictured below with Laura Quinn of ACE nursery at the launch of the SFP initiative. A second project will see the club involve those parents or guardians who unfortunately don’t have the means to fund engagement in physical exercise and from this, the club aims to create sustainable, community-based activity for these adults to maximise the likelihood of them continuing to participate in sports and lead a healthier lifestyle. Free introductory sessions will be delivered within the current Annan Athletic Community Programme portfolio and will involve each adult participating in physical activity/literacy within an enjoyable environment.